It was finally time to plan out a Vegan Dinner Menu to show all you doubters out there – you know who you are – that gourmet vegan is not only possible , but can stand up to its non-vegan counterparts. This recipe is only the beginning – I have so many recipes swimming through my head. I even got someone who would never eat a mushroom to devour this – literally lick their plate clean – you know you have done it when that happens. This meal could not have come out any better and was well worth the planning and preparation. My old friend Beef Wellington can take a back seat to my new vegan version. Say hello to Portobello Wellington! This dish is earthy, naturally sweet and full of flavor. Make this for your next dinner party and you will be sure to impress your friends. Thank you to Tyler Florence’s Ultimate Beef Wellington recipe for baking times and duxelle inspiration. This recipe is pretty easy to make as you can see. 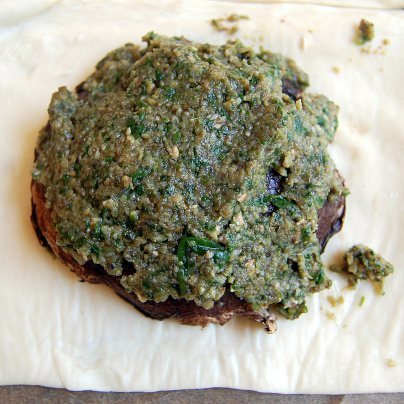 Fold pastry around the mushrooms and enclose entirely, press down lightly with fingers to make sure it is sealed tight. For the Red Wine Sauce: Combine ½ cup red wine and 1 cup vegetable stock in small saucepan. Simmer uncovered for 20 minutes. Stir in 1 tbsp date syrup and set aside. Reheat on low right before serving and drizzle over Wellington's. For the Roasted Red Potatoes: Combine potatoes, olive oil, ¼ cup vegetable stock, fresh parsley and black pepper in a small Pyrex or roasting pan and toss to coat potatoes. Roast 40 minutes or until tender and golden brown. Add extra vegetable stock if needed and stir occasionally to prevent sticking/burning. 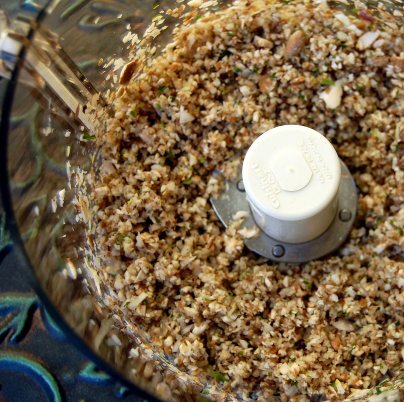 For the Duxelles: Add spinach, shiitake, button mushrooms, shallots, garlic, and tarragon to a food processor and pulse until finely chopped. Add 2 tsp. Earth Balance Butter to a large sauté pan and set over medium heat. Add the mushroom mixture, ¼ cup vegetable stock and sauté for 10 minutes until most of the liquid has evaporated. Season with a pinch of black pepper and set aside to cool. For the Glazed Baby Carrots: Combine 1 tbsp date syrup, vanilla and ⅓ cup vegetable stock in small bowl, stir to combine. Melt 1 tsp. Earth Balance butter to a large sauté pan over medium heat. Add carrots and sauce; simmer on medium heat until carrots are cooked through about 20 minutes. Deglaze the pan with more vegetable stock if needed. For the Portobello Mushrooms: Gently scrap gills from Portobello mushrooms with a spoon. 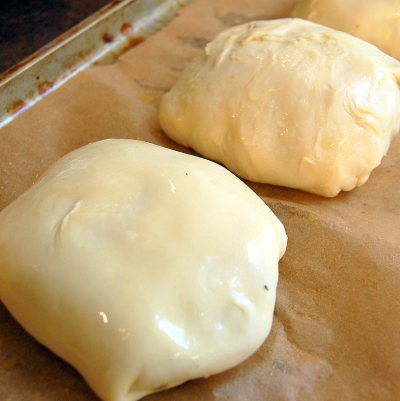 Place mushrooms on baking tray lined with parchment paper or non-stick baking mat. Bake in preheated oven for 10 minutes, set aside. Cut pastry sheet into 4 equal parts.Using a spoon, cover each mushroom with a layer of duxelles (make sure to fill the back cavity of the mushroom with the duxelles). 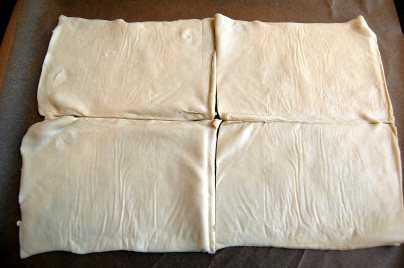 Place a mushroom in center of each pastry sheet, cavity side up. 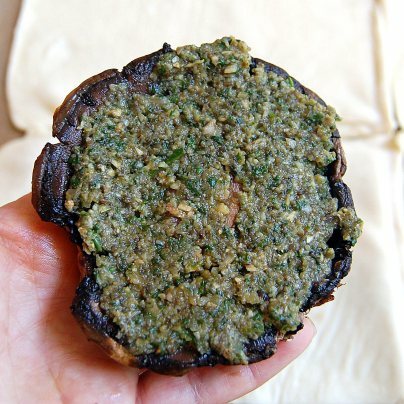 Fold pastry around the mushrooms and enclose entirely, press down lightly with fingers to make sure it is sealed completely.Place mushrooms, with folded side down, on baking tray lined with parchment paper or non-stick baking mat. Bake mushrooms in 400 degree oven until pastry is golden brown for 20-25 minutes. You can serve this with any sides of your choosing. Any way you choose this recipe will be a hit for sure! I had it a few times back in the day only with duxelle never foie gras (yuck) I'm glad I found a replacement! let me know when your try this…so good! This dish looks so delicious and fancy! This looks INCREDIBLE!! WOW! Can't wait to try it. thank you kate and anon! I can't wait to make these again they are so yummy! This looks so yummy! I've never had beef anything, let alone Beef Wellington, but I'd be willing to give this Portobello Wellington a try any day. I love the vanilla roasted carrots too. I really love the way this recipe cam out. 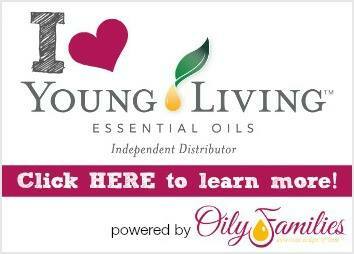 I love your blog too, I'm now following! This meal looks truly amazing! I want this for dinner! This looks unbelievably delicious!!! Wow. Yum! Thanks! THis meal came out great, my husband is begging for me to make it again this weekend! YUM! From a couple of carnivores this was perfect and we didn't even miss the meat! P.S. 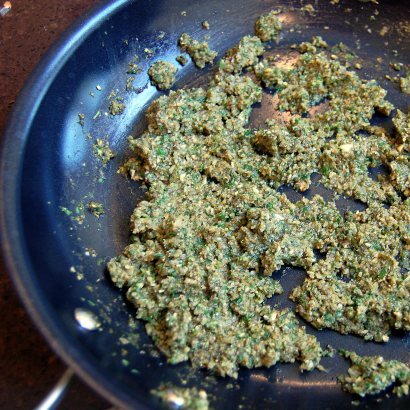 In the recipe it doesn't say when to add the spinach so we added it when we processed the mushroom duxelle. I'm glad you liked it, my husband wants me to make this again soon. Thanks for the heads up, you did what you were suppose to do 😉 and I made the changes. Thank you! O.M.G.!! Guess what I am making when I want to impress skeptical omnivores? 🙂 I love portobello mushrooms as a meat sub. What a great idea! Thanks Christina =) I REALLY need to make this again, I’m craving it! YUM! This looks amazing. I’ll be making this next weekend while it’s still cool enough to turn on the oven! This looks absolutely amazing, looking forward to making this next week when we have friends round! Is there anything I could substitute the date syrup for though? (vegan friendly!) It’s not something I’ve ever seen in the UK! Yeah 🙂 I know you will love this enjoy!! I’m so glad you liked it =) was the ecipe easy to follow? let me know so I can fine-tune it if necessary..I’m so jealous you can buy date syrup at an actual store near you, I have to order mine…grrr…isn’t it amazing? thank you! I’m making this for my Valentine of 26 years. 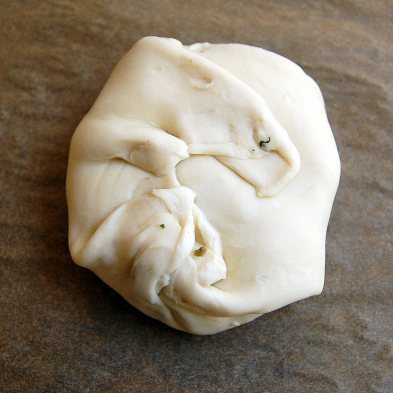 Can it be prepared ahead of time, before baking, or will the pastry get soggy? Made this last night with garlic mashed sweet potatoes and lightly steamed broccoli. It was a hit. Will definitely make it again!The wine sauce is awesome! Thanks for letting me know how it came out 🙂 glad it was a hit! I’m going to have to make this for my hubby this weekend. I made the Portobello Wellington yesterday and it was a hit. My colleage always tries to find something new and now I could surprise her with this tasteful dish. I had no tarragon so I used a handful of chopped parsley instead. Also instead of shiitake I used soaked dried porcini mushrooms. The porcini mushrooms have a slightly stronger taste that I like very much. I combined the portobellos with this ‘Roasted Red Peppers’:http://focussedonfood.blogspot.nl/2012/12/roasted-red-peppers.html and ‘Parmesan Roasted Baby Potatoes’: http://www.homecookingadventure.com/recipes/parmesan-roasted-baby-potatoes. I put the Roasted Red Peppers on top of leftover mashed sweet potato. I made last night for our Christmas dinner. Oh my goodness, it was so delicious! I will definitely make it again for birthdays and special occasions! Thank you for this recipe! Oh wow 🙂 so glad you liked it Maggie, Merry Christmas!! Such a wonderful idea, I love portobello mushrooms. i am not a vegetarian but I love creative recipes without meat! Made this last week and everything was delicious!! I’m glad you liked this recipe, it’s definitely a treat! Hi! This looks amazing! I’m juuuust starting to eat vegan so this is great! I have a question, I’m going to make this for company and am wondering if I can assemble the wellington packets the day before and keep sealed up tight in the fridge until I want to bake them off? I’ve never done that before, but I wouldn’t think it would be a problem =) Let me know how it turns out, enjoy! 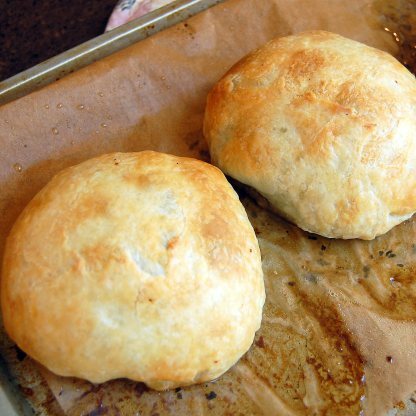 I’m making the Portobello Wellington for a girls dinner tomorrow night! I’m not vegan, but it looks so delicious! I’m going to add a little goat cheese inside the puff pastry. I’ll let you know how it turns out! From reading all the reviews, I’m sure it will be amazing! Oh that sounds great Rachel…:) let me know how it turns out! They were FABULOUS! My friends loved them! They look so fancy, too! Definitely a dish to impress people! 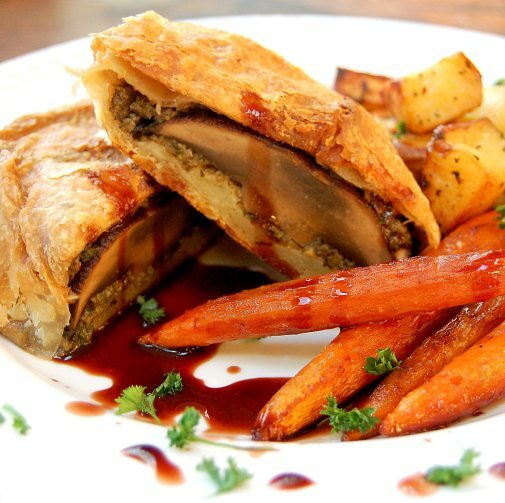 😉 If you are not vegan, here is what you should do: use beef stock instead of veggie stock, thicken up the sauce with a little butter and corn starch water mix, add goat cheese after the duxelle, add an egg wash to the portobello wellingtons before placing in the oven, and add a little melted butter right when they come out. I can’t wait for my husband to try the leftovers tonight for dinner!! Thanks for the recipe, Jennifer! My son and his girlfriend live in Boston, where there is no shortage of fabulous vegan food. They came home for a visit, so the pressure was on. I made this for them and really knocked it out of the ballpark. Absolutely delicious and very beautiful to look at. Will definitely make this again when I want to impress. Thanks so much! oh my gosh this is fantastic! I used to love chicken wellington but since switching to vegan I can’t imagine having it again. But I bet this is delicious and just the perfect thing to serve non-vegans for dinner! Hi and Thank you! This recipe is really good, I made it for Thanksgiving and it’s also great to serve for non-vegans for dinner…everyone wins! Thanks so much for stopping by! This was AH-MAZING. I’ve never had beef wellington but I cannot wait to make this again. We skipped the roasted potatoes (still had plenty of food!) and the glazed carrots were ridiculously tasty. I can’t wait to make these again, even my boyfriend was happy to eat it! I also forgot to add that we took some of the reduced carrots and wrapped them in scraps of pastry then cooked the little ‘carrots in a blanket’ with the wellington. Dipped them in the reduction and they were super tasty as well! I wonder if the chef at nyc’s narcissa saw this post and comments when he came up with “carrots Wellington”? Thank you i am going to make this for my friends 50th birthday meal. I was stuck but not now! I’ve been adding some diced apples to the mushroom duxelle with a small dash of cinnamon and it’s been wonderful, but it’s great just the way it is too…enjoy!!! Made this for my daughter-in-law for Thanksgiving. She is the only vegan in the family and has been stuck with just a salad at celebrations. Made this a day ahead of time and it puffed up, browned and was AWESOME. My son is a Sous Chef and proclaimed it delicious. She’ll be having this again at another “celebration”!!! It was a fast and easy dish to prepare. That is awesome!!!! So glad she loved it and thanks for leaving this amazing feedback! Looks absolutely amazing! I just ordered from http://wholeearthharvest.com/ and my mushrooms will be here very soon. Can’t wait to try out your recipe. Keep up the good work!!! Just found your blog today! I’ve not had any sort of wellington before but now that I’m converting to vegan this will be the one I try! I have enjoyed studying food for years and have always noticed that traditional wellingtons have a mustard layer before the duxelle layer- do you omit that altogether or did I miss that? I made this last year and we loved it. Have you tried making it ahead and freezing it? I was wondering if I could put them together (with puff pastry wrapped around) and freeze them, and then bake them straight from the freezer to try to avoid extra liquid as it thaws. Looks absolutely exquisite! Can I make this a day in advance, refrigerate and bring to room temperature before cooking? Thanks! I would think that would be fine…I just made this for friends about a week ago and it’s really wonderful…I added diced apples to the duxelle and it was a nice touch…and instead of the red wine reduction, I did a vegan brown gravy…let me know how it works out for you!